At the beginning of the season, Skokholm warden Rich Brown insisted that we moved the washing line from out of the Courtyard to the back of the garage, convinced that the billowing smalls and their peg-wielding owners were deterring migrants from settling in what is some of the best scrub and tree cover on the Island. Fast forward two and a half months to the morning of 18 June and it was my turn for the south census route. Following a clear and calm night, the walk felt more obligatory than exploratory, a good opportunity to observe fledgling birds and figure out which of the Oystercatcher pairs were still guarding chicks. After being yelled at by several of the noisy, red-billed waders I arrived at the Courtyard, having seen little else. Several of Skokholm's guests were sat around the outside table, enjoying their breakfast in the sun, but as I walked over to them I was frozen in my tracks by a song which arose from deep within the Elders. It was a song I had never heard before, nor could I place it into any family; it was a sweet descending trill, not dissimilar to a Willow Warbler but definitely not that species. My thoughts immediately went to some sort of scarce warbler, a 'phyllosc' perhaps. One of the guests noticed a change in my behaviour and said: "Oh yeah, what is that bird singing? It's been going for at least half an hour." Before I had time to explain that I had no idea, there was movement in the right-hand side of the most northerly Elder. I quickly got on it with my bins, half expecting some sort of skulking brown warbler, but it was obscured by foliage. The first glimpse I had was of its head, which was streaked and grey. Then it flitted into an open area and then immediately back into cover. As the combination of black, yellow, grey and white shot from my eyes to my brain, sheer panic set it. There, in front of me was an American wood-warbler. 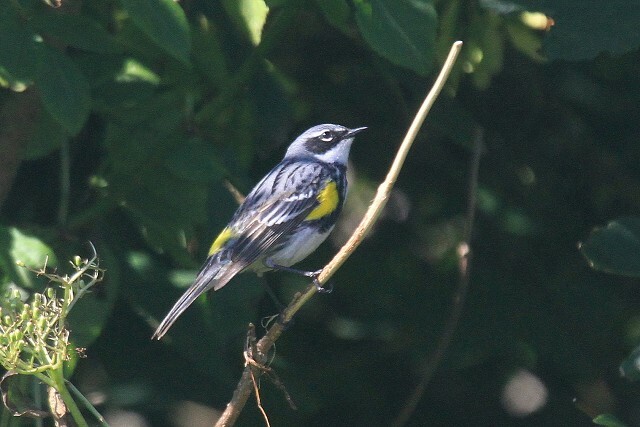 I radioed Rich telling him: "Get to the Courtyard now, as there is an American warbler singing!" Rich went from being sprawled out on the cliffs counting fly-mimics to a scope and camera-laden Olympic sprinter, while also trying to talk to me on the radio. "Describe it!" he demanded. Still in shock, the only words I could manage — curses aside — were "black and white stripes and yellow in places". The guests in the Courtyard were not birders and were completely unaware of the outrageousness of what was happening — I had to politely shush them and explain that this was something huge for Skokholm. The bird clearly wasn't that bothered about them, though, and continued to sing, as it had all morning. I am by no means overly familiar with New World warblers having only a handful of them on my life list from travels in Central America. I knew, however, that it wasn't a species I'd seen before. Rich arrived and I pointed to the direction of the song just as the bird flew out of the top of the Sycamore and over the Central Block, muttering a distinctive dry chip as it went. Panic was heightened. The song was heard again, but distantly. We scattered in different directions, as the island is a sea of bracken at this time of year providing the perfect impenetrable cover for any bird wishing to go incognito. The next few minutes were filled with tension as I swiped through my Sibley app hoping that it would become instantly clear what I had seen. Memory had blurred into an artist's palette of yellow, black, white and grey. I played a few songs but none seemed to match what I had heard so clearly just minutes before. Then came the radio call from the Courtyard: it was singing in the same Sycamore again! Rich was now firmly planted on the bench, and I stayed on the outside — if it flew off again I was going to make sure I could follow it. 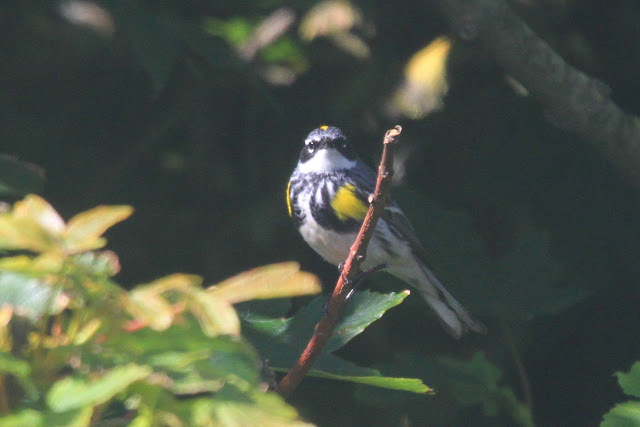 Warble followed warble, then Rich radioed, saying: 'It's just popped out, it's a Yellow-rumped [aka Myrtle] Warbler!' 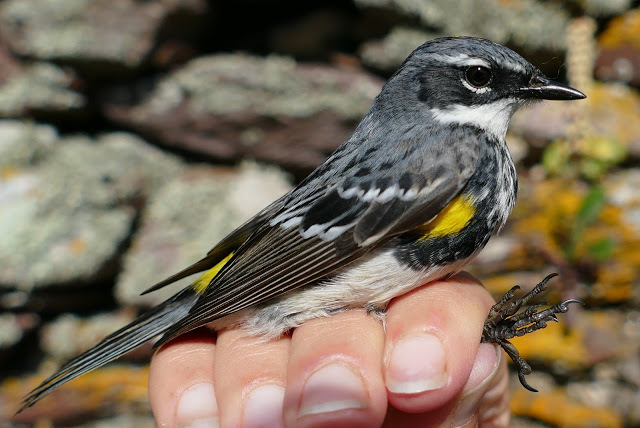 I rushed back to the Courtyard, where everyone was watching a male Myrtle Warbler feeding in the morning sun. What a sight. The yellow flank patches were dazzling, as was its spectacular yellow rump as it flitted around catching flies; this combined with the bold patches of white, black and graphite grey made for one of the most stunning birds I've seen. The bird was clearly favouring the bigger trees, and regularly moved from the Courtyard to the Cottage Garden. It made a brief foray to the Well but was probably put off by the cacophony of fledgling Jackdaws that had descended upon that area. An afternoon boat was organised for birders wanting to twitch the wood-warbler, but the short notice meant that only a handful of locals could make it. The bird performed well and spent most of the time feeding out in the open. As the afternoon went on, it became less confiding and more mobile. After disappearing for almost two hours, it was refound in the Wheelhouse Heligoland trap and was ringed. It was carrying good fat reserves and was not seen the following day, the clear night having enticed it onwards. Whether the lack of pants hanging in the Courtyard encouraged the bird to stick around cannot be known, but it was a much more pleasant viewing experience without them.